Habilitation en histoire des sciences (Paris 7, 1992). Fréquent visiteur de l’Office for History of Science and Technology à UC-Berkeley. Prix Grammaticakis-Neumann de l’Académie des Sciences (2004). Prix Georges Charpak de l’Académie des Sciences (2018). Histoire de la physique, surtout au XIXe et XXe siècles. Physique et philosophie. Physics and necessity : Rationalist pursuits from the Cartesian past to the quantum present (Oxford : Oxford University Press, 2014). Worlds of flow : A history of hydrodynamics from the Bernoullis to Prandtl (Oxford : Oxford University Press, 2005). Les équations de Maxwell, de MacCullagh à Lorentz (Paris : Belin, 2005). Electrodynamics from Ampère to Einstein (Oxford : Oxford University Press, 2000). From c-numbers to q-numbers : The classical analogy in the history of quantum theory (Berkeley : University of California Press, 1992). Les débuts de la théorie quantique des champs, 1925-1948->http://www.sphere.univ-paris-diderot.fr/IMG/pdf/Darrigol_Genese_cropped2.pdf: Thèse de troisième cycle, Paris, 1982. 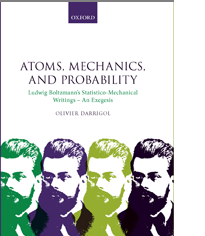 "Bohr’s trilogy of 1913," in Olivier Darrigol, Bertrand Duplantier, Jean-Michel Raimond, and Vincent Rivasseau, Niels Bohr, 1913-2013 : Poincaré seminar 2013 (Basel : Birkhäuser, 2016), 1-12. "Models, structure, and generality in Clerk Maxwell’s theory of electromagnetism," in Karine Chemla, David Rabouin, and Renaud Chorlay (eds. ), The Oxford handbook of generality in mathematics and the sciences(Oxford : Oxford University Press, 2016), 345-358. "Why some physical theories should never die," http://www.sphere.univ-paris-diderot.fr/IMG/pdf/Martins_paper.pdf in João Principe (ed. ), Évora studies in the philosophy and history of science. In memoriam Hermínio Martins (Casal de Cambra : Caleidoscópio, 2015), 319-368.
for quantum theory," Studies in the history and philosophy of modern physics, 52 (2015), 328-342. "Mesh and measure in early general relativity," Studies in the history and philosophy of modern physics, 52 (2015), 163-187. "Georges Sagnac : A life for optics," Académie des sciences, physique, Comptes rendus, 15 (2014), 789-840. "The mystery of Riemann’s curvature," Historia mathematica (2014), 47-83. "The quantum enigma," in Michel Janssen and Christoph Lehner, The Cambridge companion to Einstein (Cambridge : Cambridge University Press, 2014), 117-142. "The emergence of statistical mechanics," in Jed Buchwald and Robert Fox (eds. ), The Oxford companion for the history of physics (Oxford : Oxford University Press, 2013), 765-788. "Maurice de Broglie : El descenso en el átomo," in José Manuel Sánchez Ron (ed. ), Creadores cientificós : La física en la residencia de estudiantes [1910-1936] (Madrid : Publicationes de la Residencia de Estudiantes, 2013), 145-162. "A few reasons why Louis de Broglie discovered matter waves and yet did not discover Schrödinger’s equation," in Wolfgang Reiter et al. (eds. ), Erwin Schrödinger—50 years after (Zürich : European Mathematical Society, 2013), 166-174. "For a philosophy of hydrodynamics," in Robert Batterman (ed. ), The Oxford handbook of philosophy of physics (Oxford : Oxford University Press, 2013), 12-42. "Poincaré’s light," in Poincaré, 1912-2012. Séminaire Poincaré. Samedi 24 novembre 2012, 1-43. URL = http://www.bourbaphy.fr/darrigolpoin.pdf . Version définitive dans in B. Duplantier and V. Rivasseau (eds. ), Henri Poincaré, 1912–2012 : Poincaré Seminar 2012 (Basel : Birkhäuser, 2015), 1-50. "Electrodynamics in the physics of Walther Ritz," in Jean-Claude Pont (ed. ), Le destin douloureux de Walther Ritz, physicien théoricien de génie (Sion : Vallesia, 2012), 207-240. "La radiazione e il quanto," in Storia della scienza, vol. 8 : La seconda rivoluzione scientifica (Roma : Istituto della Enciclopedia Italiana, 2012), 408-412. "James MacCullagh’s ether : An optical route to Maxwell’s equations ?" The European Physical Journal H, 35 (2010), 133-172. "The analogy between light and sound in the history of optics from Malebranche to Thomas Young," Physis, 46 (2009), 111-217.
from the ancient Greeks to Isaac Newton," Centaurus, 52 (2010), 117-155 ; 206-257. "Stueckelberg’s united field-theory of matter, 1936-39," in Jan Lacki, Henri Ruegg, and Gerar Wanders (eds. ), E.C.G. Stueckelberg, an unconventional figure of twentieth century physics. Selected scientific papers with commentaries (Berlin : Springer, 2009). "A simplified genesis of quantum mechanics," Studies in the history and philosophy of modern physics, 40 (2009), 151-166. "From Newton’s mechanics to Euler’s equations" (avec Uriel Frisch), Physica D : Nonlinear Phenomena, 237 (2008), 1855-1869. "Empirical challenges and concept formation in the history of hydrodynamics," Centaurus, 50 (2008), 214-232. "The modular structure of physical theories," Synthese, 162 (2008), 195-223. "For a history of knowledge," in Costas Gavroglu and Jürgen Renn (eds. ), Positioning the history of science [in honor of Silvan Schweber] (Dordrecht : Springer, 2007), 33-34. "Diversité et harmonie de la physique mathématique dans les préfaces de Henri Poincaré," in Jean-Claude Pont et al. (eds. ), Pour comprendre le XIXe : Histoire et philosophie des sciences à la fin du siècle (Florence : Olschi, 2007), 221-240. "On the necessary truth of the laws of classical mechanics," Studies in the history and philosophy of modern physics, 38 (2007), 757-800. "A Helmholtzian approach to space and time," Studies in the history and philosophy of science, 38 (2007), 528-542. "A Faradayan principle for selecting classical field theories," International studies in the philosophy of science, 21 (2007), 35-55. "The acoustic origins of harmonic analysis," Archive for the history of exact sciences, 61 (2007), 343-424. "1905 : Un nouvel élan," in M. Leduc and M. Le Bellac (eds. ), Einstein aujourd’hui (Paris : EDP Sciences/ CNRS Éditions, 2005), 1-38. "Faut-il réviser l’histoire de la relativité," Lettre de l’Académie des Sciences, 14 (2004), 6-7. Repris dans le Bulletin de la Société Française de Physique et dans le Bulletin de l’Union des Physiciens. "The mystery of the Einstein-Poincaré connection," Isis, 95 (2004), 614-626. "The spirited horse, the engineer, and the mathematician : water waves in nineteenth-century fluid mechanics," Archive for the history of exact sciences, 58 (2003), 21-95. "Number and measure : Hermann Helmholtz at the crossroads of mathematics, physics, and psychology," Studies in history and philosophy of science, 34 (2003), 515-573. "The Voltaic origins of Helmholtz’s physics of ions." In Fabio Bevilacqua and Enrico Gianetto (eds), Volta and the history of electricity (Milano : Hoepli, 2003), 2-16. "La nascita della meccanica statistica" (with Jürgen Renn), in Storia della scienza, vol. 7 : L’ottocento (Roma : Istituto della Enciclopedia Italiana, 2003), 496-507. "La termodinamica," in Storia della scienza, vol. 7 :L’ottocento (Roma : Istituto della Enciclopedia Italiana, 2003), 470–481. "Quantum theory and atomic structure, 1900-1927," in Mary Jo Nye (ed.) The Cambridge history of science, vol. 5 : The modern physical and mathematical sciences (Cambridge : Cambridge University Press, 2003), 331-349. "Stability and instability in nineteenth-century fluid mechanics," Revue d’histoire des mathématiques, 8 (2002), 5-65. "Turbulence in nineteenth-century hydrodynamics," Historical studies in the physical sciences, 32 (2002), 207-262. "Between hydrodynamics and elasticity theory : The first five births of the Navier-Stokes equation," Archive for the history of exact sciences, 56 (2002), 95-150. "Genève, centre de diffusion de l’électrodynamique nouvelle," Archives des sciences naturelles de Genève, 54 (2001), 103-112. "God, waterwheels, and molecules : Saint-Venant’s anticipation of the energy principle," Historical studies in the physical and biological sciences, 31 (2001), 285-353. "The historians’ disagreements over the meaning of Planck’s quantum," Centaurus, 43 (2001), 219-239. "Continuities and discontinuities in Planck’s Akt der Verzweiflung," Annalen der Physik, 9 (2000), 951-960. "Poincaré, Einstein, et l’inertie de l’énergie," Comptes rendus de l’Académie des sciences, 1 (2000), 143-153. "Baconian bees in the electromagnetic fields : Experimenter-theorists in nineteenth-century electrodynamics," Studies in the history and philosophy of modern physics, 30 (1999), 307-345. "Toward a new topology of scientific practice" (essay review of Peter Galison, Image and logic : a material culture of microphysics, Chicago, 1997), Historical studies in the physical and biological sciences, 28 (1998), 337-351. "From Organ pipes to atmospheric motion : Helmholtz’s works on hydrodynamics," Historical studies in the physical and biological sciences, 29 (1998), 1-51. "Aux confins de l’électrodynamique maxwellienne : Ions et électrons vers 1897," Revue d’histoire des sciences, 51 (1998), 5-34. "Classical concepts in Bohr’s atomic theory (1913-1925)," Physis, 34 (1997), 545-567. "Histoires de pratiques, pratiques de l’histoire," Revue d’histoire des sciences, 50 (1997), 195-206. "The electrodynamic origins of relativity theory," Historical studies in the physical and biological sciences, 26 (1996), 241-312. "Patterns of oblivion : The case of Guido Beck," Anais da Academia Brasileira de Ciencias, 67 (1995), supl. 1 : 37-47. "Henri Poincaré’s criticism of fin de siècle electrodynamics," Studies in history and philosophy of modern physics, 26 (1995), 1-44. "Emil Cohn’s electrodynamics of moving bodies," American journal of physics, 63 (1995), 908-915. "Nihon ni okeru rironbutsurigaku no kenkyû," in Seimitsukagaku no shisô, vol. 11 : Gendaishisô (Tôkyô : Iwanamishoten, 1995), 211-230. "The electron theories of Larmor and Lorentz : A comparative study," Historical studies in the physical and biological sciences, 24 (1994), 265-336. "Helmholtz’s electrodynamics and the comprehensibility of nature," in L. Krüger (ed. ), Universalgenie Helmholtz (Berlin, 1994), 216-242. "Les premier travaux de Louis de Broglie," in La découverte des ondes de matière, Académie des sciences (Paris, 1994). "Strangeness and soundness in Louis de Broglie’s early work," Physis, 30 (1993), 303-372. "The electrodynamic revolution in Germany as documented by early German expositions of `Maxwell’s theory’," Archive for the history of exact sciences, 45 (1993), 189-280. "The electrodynamics of moving bodies from Faraday to Hertz,"
"Schrödinger’s statistical physics and some related themes," in M. Bitbol et O. Darrigol, éds., Erwin Schrödinger. Philosophy and the birth of quantum mechanics (Gif sur Yvette, 1992), 237-276. "Cohérence et complétude de la mécanique quantique : l’exemple de Bohr-Rosenfeld," Revue d’histoire des sciences, 44:2 (1991), 137-179. "Statistics and combinatorics in early quantum theory, II : early symptoms of indistinguishability and holism," Historical studies in the physical sciences, 21:2 (1991), 237-298. "Dirac, Paul, Adrien, Maurice," Dictionary of scientific biography, Supt. 2 (New York, 1989), 104-109. "Brillouin, Léon," Dictionary of scientific biography, Supt. 2 (New York, 1989), 224-233. "The quantum electrodynamical analogy in early nuclear theory or the roots of the Yukawa theory," Revue d’histoire des sciences, 16 (1988), 225-297. "Statistics and combinatorics in early quantum theory," Historical studies in the physical sciences, 19 (1988), 17-80. "Elements of a scientific biography of Tomonaga Sin-Itiro," Historia scienciarum, 35 (1988), 1-29. "The origins of quantized matter waves," Historical studies in the physical sciences, 16 (1986), 197-253. "La complémentarité comme argument d’autorité (1927-1934)," Revue d’histoire des sciences, 38 (1985), 309-323. "A history of the question : Can free electrons be polarized ? ", Historical studies in the physical sciences, 15:1 (1984), 39-79. "La genèse du concept de champ quantique," Annales de physique, 9 (1984), 433-501. M. Bitbol et O. Darrigol (eds. ), Erwin Schrödinger. Philosophy and the birth of quantum mechanics (Gif sur Yvette : Frontières, 1992). T. Damour, O. Darrigol, B. Duplantier, V. Rivasseau (eds. ), Einstein 1905-2005 : Poincaré seminar 2005 (Basel : Birkhäuser, 2006). O. Darrigol, B. Duplantier, J.-M. Raimond, V. Rivasseau (eds.). Niels Bohr, 1913-1013 : Poincaré seminar 2013 (Basel : Birkhäuser, 2016). Séminaire d’histoire et philosophie de la physique organisé en collaboration avec Nadine de Courtenay, Sara Franceschelli et Jan Lacki.